Here’s some news for any Verizon prepaid fans out there. 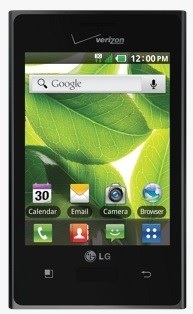 They recently added two LG devices to their line-up: the LG Optimus Zone and Optimus Exceed. The LG Optimus Zone (pictured) is a revamped version of the LG Optimus L3 II. It has a 3.2-inch QVGA display, 800MHz processor with 4GB of internal storage, a3.2-megapixel camera with video capture, Wi-Fi, GPS, Bluetooth 3.0, and a 1,540mAh battery. The Optimus Zone is limited to 3G data and runs Android 2.3.6 Gingerbread (noted as one of the most popular Andy versions to date.) It costs $79.99. The LG Optimus Exceed is a newer version of the LG Lucid. The Exceed features a 4-inch display protected by Corning’s Gorilla Glass, a 5-megapixel camera with 1080p HD video capture, a user-facing camera, and a dual-core 1.2GHz processor with 1GB of RAM. The LG Optimus Exceed runs Android 4.0 Ice Cream Sandwich and is also limited to 3G data. It costs $129.99. For more information check out Verizon’s website.